A new Virginia poll shows Governor Ralph Northam’s disapproval rating has more than doubled since his yearbook photo scandal broke in February. CHARLOTTESVILLE, Va. (WVIR) - A new Virginia poll shows Governor Ralph Northam’s disapproval rating has more than doubled since his yearbook photo scandal broke in February. The poll from the Wason Center for Public Policy shows the governor’s disapproval rating at 49%. Despite the increase, only 29% of Democrats still think he should resign. “Ralph Northam learned a lesson from Donald Trump; if you have a great adversity, just sit there and take criticism and refuse to do anything about it and it will go away and that’s pretty much what’s happened, although there’s been some damage to Northam,” said Larry Sabato of the University of Virginia Center for Politics. The poll from the Wason Center for Public Policy shows approval ratings drop for Virginia&apos;s top three politicians. 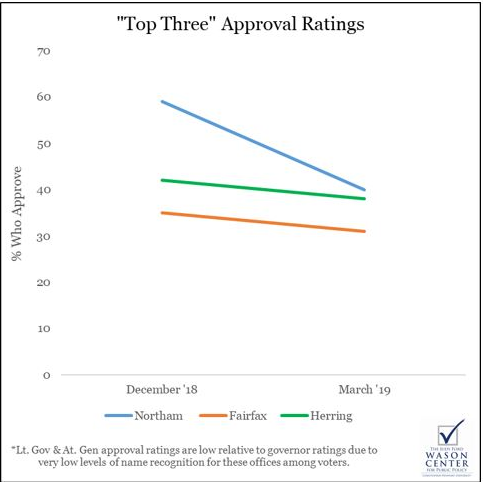 Lieutenant Governor Justin Fairfax – whose been accused by two different women of sexual assault – also saw disapproval ratings triple from 13 to 39%.